See the polka-dotted corner embellishments? Those are SO easy to create with strips of Lime/White Dots washi tape--just wrap the ends around the edges! Looking for some more ideas for this sweet robot stamp? Be sure to check out the rest of the team's lovely creations today on the DeNami blog. Like what you see? 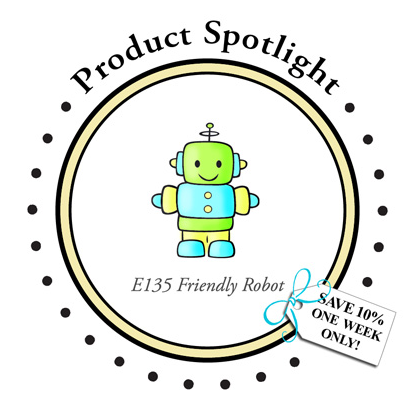 Then you can score a great deal on the Friendly Robot--as our Spotlight Product, it's on sale at 10% off for the next week!! Your little robots are adorable! It's so cute the way you arranged them in a circle around the center one. The corners in the washi is a great idea to make a design look finished. I love this design Emily! The colors you used are fabulous! A fun card for sure! CUTENESS overload Emily!! And I am SO going to remember this washi treatment, looks great! Your card is super adorable!!! I got my prize! Thank you so much!! This would be such a great card to give a kid--big or little--LOL!